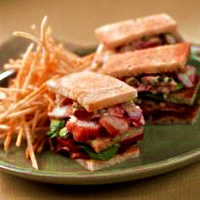 This classic double-decker sandwich can be stepped up a notch with delicious Maine lobster meat. For a successful club sandwich, you are going to need a hearty bread to carry all the delicious lobster meat, bacon, avocado, tomato and arugula you are going to use in the recipe. 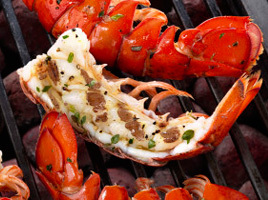 Remove lobster meat from container, drain, pat dry and cut into 1/2″ pieces. 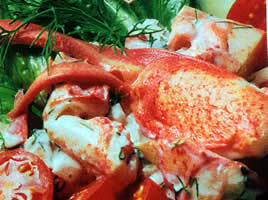 Combine the lobster meat, celery, green onions, and parsley in a bowl. Add 1/8 cup of the lemon mayonnaise. Mix well and season with salt and pepper. Set aside. Toast the bread. Generously spread one side of each piece of bread with lemon mayonnaise. Top one slice of bread with the arugula, 2 slices of tomatoes, and bacon. Place a toasted piece of bread on top. 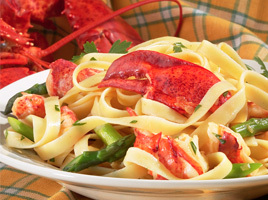 Add the avocado slices and Maine Lobster mixture on top of that. Place the other piece of toast on top, and secure with wooden toothpicks. Cut the sandwich diagonally into 2 pieces. Place on the plate with the sandwich open about 30 degrees so the guest can see the filling.